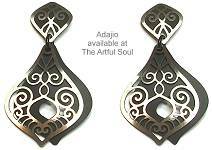 So many earring styles are available on The Artful Soul website...if you are looking for a particular style, try the links below, or use the designer name links on the left. This page features earrings for pierced ears that have post top and dangle! Nice and lightweight but rich with glossy beads, these earrings have neutral dark terracotta, moss and brown colors. The cluster dangles below a metal piece that has dark pewter and copper in dimpled pattern. Post near top for pierced ears. 2 inches long. Twisting lifesaver links are intertwined into a lightweight classic earring. Glasslike jeweler's resin forms two of the loops, at center is a gold vermeil one (18kt gold on sterling). 1-7/8 inches long, 7/8 inch across, a surgical post is located at the very top. The color is translucent olive green, like medium jade. Simple round lasercut stainless steel pieces, lightweight and easy size for anyone to wear, the patterns under clear resin are accented by tiny crystal beads. Colors featured are cream, turquoise, sunny gold and orange. Lasercut stainless steel shapes are simple rounds with extended dots of coordinated crystal colors. Colors featured are salmon pink, brick red, black and metallic gold. 7/8 inches long, 3/8 inch across. Glowing frosted lemon-lime glass at top has surgical post behind. Suspended below is teardrop of metal that is completely filled by mosaic of glass and crystal in fuchsia, turquoise, lime, orange and lavender beads. 2-3/8 inches long, 7/8 inch across. Surgical post. Pewter elements have brushed shiny top finish, with recessed areas blackened. The design of circles and curving bands is rather like the rings of a tree trunk, and the outer bark, very graceful. As a metallic neutral, wear these everyday, especially imagine them with a stripe or dot pattern outfit! 2-1/8 inches long, 5/8 inch across, the polished pewter has etched designs and brass wire detail. Surgical steel post 1/4 inch below top edge. Very light in weight! By The Artful Soul, this is part of a fuchsia pink geometrics polymer clay collection, dark/light rose and fuschia with mere hints of green and charcoal. Detailed handbuilt patterns are sliced and mounted onto background clay, accented with gold leaf, then fired. Light and artful. 3/4 inch square has disk drop, surgical post 1/4 inch below top point. 1-5/8 inches long overall. Golden wire threads are crocheted into the lovely fan shapes, which are joined together at the tops to a square dangle, allowing each fan to swing independent of the other. Very flirty! White glass pearl captured in each piece. Goldplated post for pierced ears. These are 2-1/4 inches long, about 1-3/4 inches across. Earrings are 1-7/8 inches long, 5/8 inch across, surgical post at top. Gold-plated frames are joined in simple interlocking rings line. Dark and light topaz yellow Swarovski crystals sparkle, backed by metal for deeper color range. 2-1/4 inches long, 15/16 inch across. Surgical post. Lead-free pewter elements have brushed shiny top finish, with recessed areas blackened. Gracefully busy patterns that are similar on top and bottom, evoke the forest trees along the bottom and stretching upward into the sky. But it can be interpreted in other interesting ways, a delight for everyday wear and attention! 3/4 inches long, 1/4 inch across. Petite and lovely setting in silver finish metal, holding clear AB crystals with hint of mint in glass beads. Surgical post. 1-1/4 inches long with surgical post, 9/16 inch across. Art deco style in shield shapes and motif, metal is colored golden brass and burgundy. 1-1/4 inches long with surgical post, 5/8 inch across. Graceful black metal background is covered by cutout filigree pieces in silver metal. Super slender packed with color from small round top of beads circling a crystal, dangle has print under glass and finishes with icy silver faceted bead dangle.